Are you using your glider’s flaps to their full potential? Don’t miss the expert advice in the Aug/Sept issue of S&G, where you can also discover why the Perkoz could become the club trainer of the future. There are top tips on successfully reading the thermalling day as it unfolds, and you can also find out how UK pilots benefited from a Sebastian Kawa masterclass. Tim Macfadyen admits to being unpleasantly surprised at how little many pilots know about the gliders they fly. 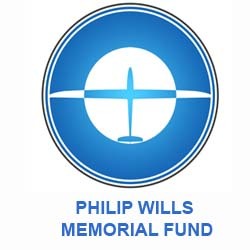 Having flown over half of the types of glider in the UK, including 40 types with flaps, Tim is the ideal person to provide expert advice on the correct use of flaps and his comprehensive article is not to be missed. Understanding how nature’s diurnal cycle can shape soaring conditions as the day unfolds is also an essential skill to have. In the second part of an Ask the coach article, Tony Cronshaw continues his discussion with coach Kevin Atkinson on making the right decisions on a thermalling day. It’s not every day that you can fly with someone of Sebastian’s calibre, but learning in the right glider is a good place to start. SZD Allstar’s Perkoz demonstrator has visited several UK clubs. With clubs searching for a natural successor to ageing two-seater fleets, Tim Beasley has been so impressed with the Perkoz that he thinks it is the ideal club trainer of the future. With its aerobatic capabilities, it could also boost aerobatic training at clubs. Alisport’s Silent Electro has been making the headlines with the trial in Italy of a new competition intended to refresh and invigorate the 13.5m Class. The competition, X-Italia 2016, was organised to coincide with the Sailplane Grand Prix qualifier in Varese and also the cycling event Giro d’Italia, which is second only to the Tour of France. X-Italia 2016 aimed to maximise the exposure of gliding within the media and to do something radically different. Winner Stefano Ghiorzo believes that, while the formula may not appeal to purists, it will attract a new and potentially larger audience of recreational pilots who are currently not involved in competition. 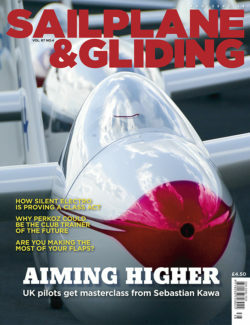 Also in this issue: Guy Roth, 16, explains why aerobatics is the perfect way to sharpen your gliding skills. Claudia Hill joins a group of German women on a mountain flying course in the Alps. Richard Cole explains why Yorkshire GC now has two EuroFOX in its tug fleet. Jon Gatfield highlights a safety device that could solve problems for FLARM users when it comes to spotting head-on alerts. David Innes attempts to take part in his first competition in 37 years. Debb Hackett reports as Willy Hackett continues his quest to fly as many Schweizers as possible. BGA Development Committee Chairman Dave Latimer explains how social media is enhancing participation in gliding. Bruce Stephenson reports on the events kicking off the vintage season. 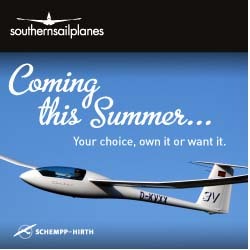 David Sibthorp reveals why Banbury junior Robert Holloway was awarded a EuroFOX Aviation scholarship. Plus, there are many more of your stunning images in the Gallery pages. A club trainer of the future?